AquaMon is available in several network configurations. The simplest configuration is as a standalone, single-node system. 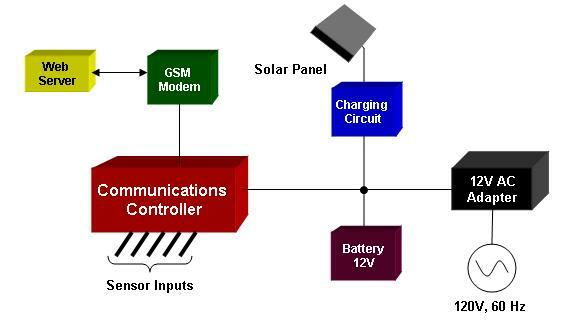 In this configuration local sensors connect directly to the communications controller where the data can be stored in the on-board memory and packaged for transmission to the secure web server. The data is passed to the web server via an embedded GSM modem at prescribed intervals. As with other AquaMon sensor nodes, the single-node system accepts several sensor interfaces. The single-node system can connect to 2.5 Volt analog sensors, SDI-12 sensors, and 4-20 milliamp current loop sensors. With one sensor board the single-node system can accommodate up to six sensor inputs. A second sensor board can be added to permit connection of another six sensors. Like other AquaMon sensor nodes, the single-node system also provides digital outputs to control systems in the field. Connected equipment such as pumps, valves and lights can be activated or deactivated with RSVP from the secure web server. The remote control of these functions can be performed with a user input to RSVP or the grower can configure the secure web server to automatically activate or deactivate control lines when programmed limits are reached. Cermetek offers single-node systems in several varieties. The differences in models reflect variations in how the systems are powered and the number of sensor boards. For installations with AC power available, the single-node system can be configured to operate with a 12 volt adapter plugged into a standard 120 Volt AC outlet. AC powered systems can be equipped with an optional battery backup to allow single-node system operation to continue during a power outage. In locations where AC Power is not readily available, the AquaMon single-node system can chosen with battery power as the primary power source. In this configuration a solar panel is available as an option to maintain the battery charge and extend the life of the battery. Single-node systems can be ordered with one or two sensor boards. Each sensor board can accept up to 6 analog sensors. The number of control lines available to control external systems also increases when the additional sensor board is added.